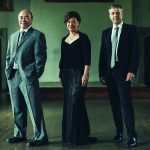 Gryphon Trio has firmly established itself as one of the world’s preeminent piano trios. Performing repertoire that ranges from traditional to contemporary, they tour regularly throughout North America and Europe. With 20 recordings, 75 new works commissioned, and multi-genre collaborations to their credit, they earned accolades including two JUNO Awards, the prestigious 2013 Canada Council’s Walter Carsen Prize for Excellence in the Performing Arts, and touring awards across Canada. They are Artists- in-Residence at the UofT`s Faculty of Music and Trinity College. Roman Borys is Artistic Director of the Ottawa’s Chamberfest. Annalee Patipatanakoon and Jamie Parker serve as the Festival’s Artistic Advisors.